Hi! So I've never worked on Airs much, and then I came across a few of them. One powered on (model A1304) but was missing the hard drive. Easy enough, I thought. One of the other Airs (completely dead) had a hard drive cable, so after buying a 120GB "MacBook Air hard drive" on eBay for $70, I thought I'd be all set. However, it turned out that the cable from the other machine had a different connector on the logic board side than my working machine (machine's connector is squarish, whereas the cable's connector is more rectangular). So the next step was to buy the appropriate cable on eBay. It came in today, and the next gotcha is that the cable on the HD side is only half the width of the connector on the HD, so (I assume) it won't work with my drive. I was not aware there were different connectors on these hard drives. Question is, for all you people more familiar with these tiny hard drives than I am: What are the variations (small connector vs wider connector) called? 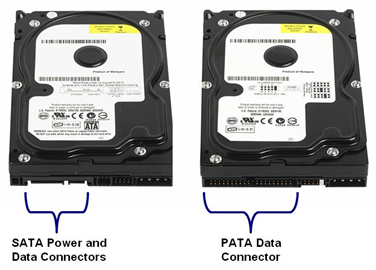 Is it the SATA vs PATA versions of these drives? I need to purchase yet another drive to finally finish up this Air, and I don't want to make another mistake, so it would be useful to know the proper terminology. UPDATE: I've uploaded a picture showing the two cables, and the two different connector types on either end. As you can see, one fits and is the same width as the connector on the hard drive, and the other is too small. The bottom cable in your photo should be the correct cable for your system. Does this plug into the logic board OK? Correct, the bottom cable is the right one for my Air, but unfortunately the HD end of the cable is too small for the drive, as shown. I am now in search of an appropriate drive that does not cost as much as a new car, and hopefully I will be able to purchase it with some certainty that it IS the appropriate drive, and not another of the wrong drive. Both the Late 08 and the Mid 09 models have the same HDD cable regardless of the type of drive installed. Also refer to THIS. In particular the Note on the connector type. Seems the correct HDD's have a non standard connector on them! Instead of a standard connector Apple uses a 40-pin ZIF (Zero Insertion Force) connector. THIS guide may also assist, particularly step 15 which talks about 2 differing types of connector on the HDD. They utilise a ZIF connector rather than the standard bulky connector... and there are at least 2 variants of the ZIF used it seems. I agree. I just find it frustrating that no one seems to have defined what to call either size, and that no one selling the drives really specifies either way. The original MacBook Air should use a 40pin connector with a PATA communication protocol to the logic board. Most eBay suppliers tend to refer to this as ZIF. The subsequent MacBook Airs (Late 2008 or Mid 2009) should use a 24pin connector with a SATA communication protocol to the logic board. Some eBay suppliers tend to refer to this as LIF. the down cable is the one am looking for, the machine was taken to some technicians who after failing to load the os x they ended up to damage both the cable and the hdd cable locker so am just looking at buying another cable and the hdd to have this machine work again, right now it working on external which is very bad for the MacBookAir it only has 1 usb, help me to fix it it's for the clients who just wants it working.